I just started reading Jacques Pepin's autobiography Apprentice; My Life in the Kitchen, and so far I'm loving it. Between that and reading Julia Child's My Life in France last winter (I don't know if I mentioned that I read it here....I didn't do a proper book report on it, but you should read it. It's awesome and inspiring. Do it. ), I really want to go to France for an extended period of time. Anyway, I'm only a few chapters into Apprentice, but I've already had to cook something from it. Jacques Talks about his mother Jeanette's special egg dish. 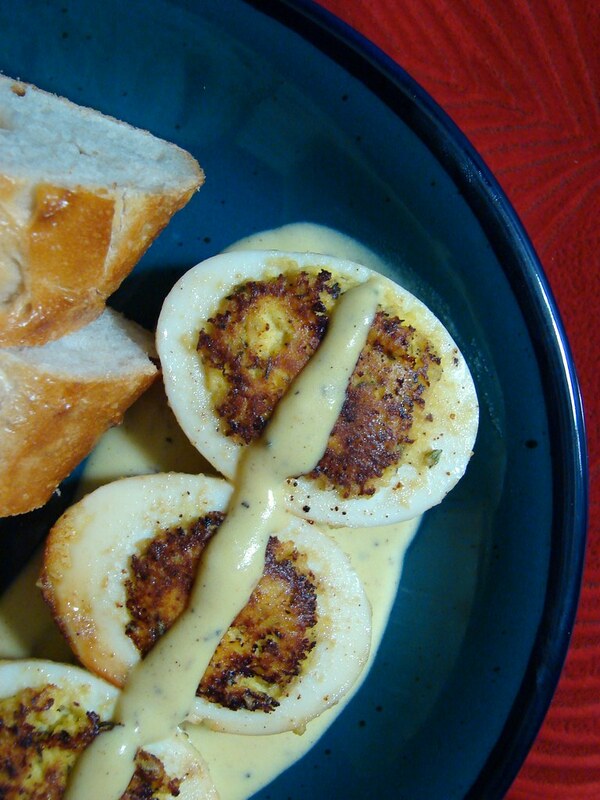 It's essentially deviled eggs that are pan fried and served with an egg dressing and some bread. I had everything I needed for it at home, and it sounded like a perfect simple comfort food for a rainy evening. Cut the eggs in half crosswise at the widest point. Remove the yolks mash them, using a fork, with milk, garlic, thyme, salt, and pepper. The mixture should be moist and hold together. Restuff the whites with the yolk mixture, reserving approximately 1 1/2 tablespoons for the sauce. Heat the oil and butter in a skillet, preferably the nonstick type. When the oil and butter are hot and foaming, place the egg halves, stuffed side down, in the skillet. Fry at medium heat for about 2 minutes. They will brown beautifully on the stuffed side. (Egg whites do not brown well and get tough if cooked in the hot fat.) Remove the eggs from the skillet, and arrange them over the sauce. 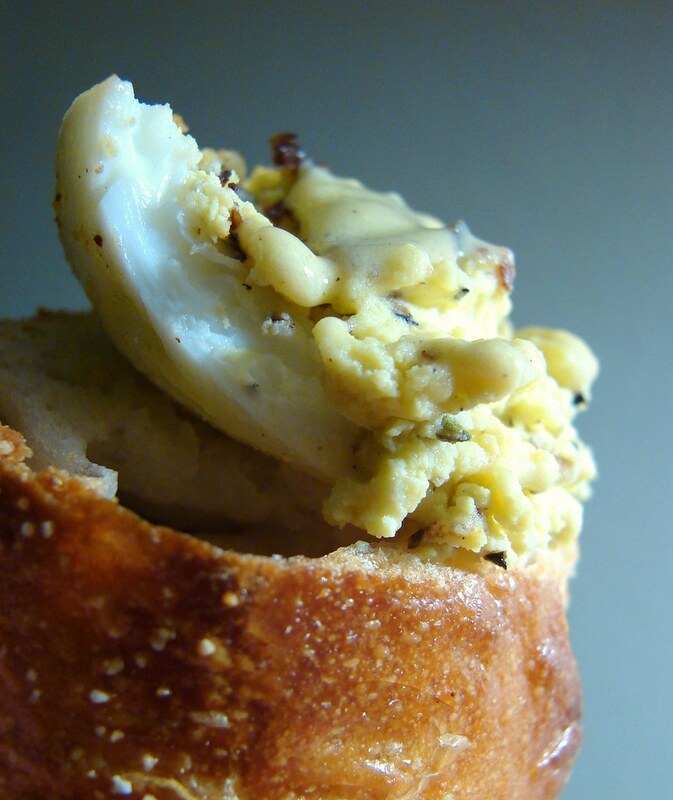 Serve lukewarm or at room temperature with crusty French bread. Combine everything but the olive oil in a bowl. Slowly pour in the olive oil while whisking until you have a nice sauce consistency. Yes. I say "yes" to this dish and to Jacques Pepin and to his mother. A lovely dinner...simple and flavorful with out being over-the-top rich. The mustard of the dressing really cuts through the rich yolks, and everything together smeared on warm crusty bread is quite beautiful. I'm excited to read the rest of the book and discover more rustic yet elegant dishes like this. Jacques Pepin is one of the World's greatest Chefs....you certainly made a tasty choice. If you have the opportunity you should check ou the shows where Jacques and Julia cook together....pass the butter!! I've had this same recipe bookmarked for a while! I'm glad to hear it's good. I'll definitely have to try it soon. Wow, this looks insanely good! I love deviled eggs but I've never heard of pan frying them. They look fantastic. I have everything in my kitchen too, I'm making these right away! This looks so delicious... A new way for me to prepare eggs. Excellent! Egg Heaven should be the name of this. Oooh, I do love eggs! I've never seen a dish like this and you can bet that I'll be boiling some eggs tomorrow! Yum! These eggs sound awesome! Thanks for sharing the recipe ... can't wait to try them! Are your sure this are not Eggs Lalaine? Because they sure have my name on it! Nice Web site! I have been making Eggs Jeanette for over 28 years...it is wonder-full recipe,a crowd pleaser that easilly adjust itself to seasonal ingredients and taste, what you choose to serve it with, and at which what meal you make it. Finding this recipe in an interview with Jaques in Christian Science Monitor - he talked about the need or the cook to use ingredients on hand, to not waste and to cook with their imaginations/hearts - to not confuse elaborateness/extarvagance with substance. Great permissions that have been guiding me for years! I tried these this morning, but I didn't have all the right ingredients. 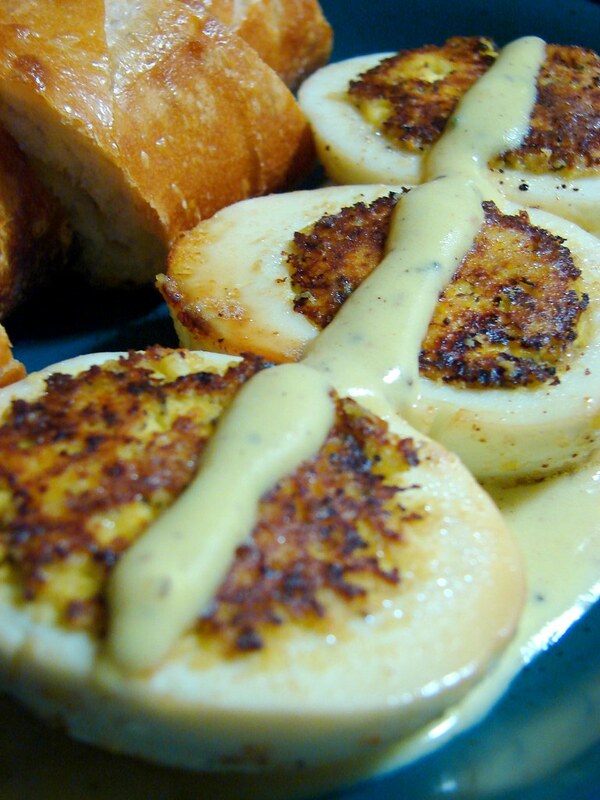 I used milk, garlic, ranch dressing, ranch dip mix and seasoned bread crumbs, along with salt and pepper. I boiled the eggs, prepared the inside, then used the ranch dip mix and seasoned crumbs as a sprinkle. Then I fried them and made a sauce with all the ingredients mentioned and some water. OH MY FREAKING WORD they were delicious! I might have to do this weekly... and for special occasions. :P Thanks so much for the post! Since he was talking about using leftovers, I'm assuming he was using old eggs. The older the egg, the easier it is to peel. I can't peel my farm-fresh eggs for anything, but an old supermarket egg will peel easily every time. Damn this was good!! Way better than I expected. I used the egg yolk, salt, pepper, plain yogurt, fresh garlic, and a bit of sharp cheddar cheese. YUM!!! This sounds sooo delicious! Is 1/2 Tablespoon dried thyme for 3 eggs correct?